The 1976 program stays the same approximate size at 8 1/2" x 11" as do those through 2010. The price remains $2 in 1976 but raises to $3 in 1977 and stays so through 1981. The price raises to $4 in 1982-1986, $5 from 1987-1990, $6 for 1991 & 92, $7 in 1993, $8 in 1994-1997 and $10 from 1998 through 2008 and 2010 with 2009 at $12. The price is noted on the cover through 2000, but is removed on programs from 2001 to the present. 2001 marks the first year programs were sold with a clear plastic holder to protect them. The 1976 insert retains the same size and basic format as 1975. In 1977 the same basic size remains but the insert is now two pages with drawings of the cars with driver names, car type/name and qualifying speeds. The 1978 insert marks the first time the insert was printed as part of the program. This may have been for the actual race day programs as *loose inserts were probably available on Carburation Day as they are today. This same idea remains so through 1994. With the 1995 program, an insert coupon was added to all programs so that when the insert was available, (usually on Carb Day) one would exchange the coupon for an insert. Inserts could still be obtained without having to tear the coupon out of the program therefore keeping the program intact. Changes in the insert will be noted when necessary. The insert coupon is dropped after 2005. The 1976 program is a transition program in that it retains some of the features of previous programs, but some changes have occurred. The flags remain, but are now at the top above a drawing of the new museum with a checker board pattern below the museum. "The 60th" and "500" are in black at upper left and right respectively with "Official Program" at bottom center also in black. The date and "2 Dollars" are in black at bottom left and right respectively with small copyright information between them. 1977 begins a new line of programs where the cover changes every year much as they did before 1955. This also marks the first year where the cover folds out. The 1978 through 1980 covers also fold out. At top is a drawing of the front stretch, car #6 and Tony Hulman giving the command to start engines. At the bottom are the main gate and A.J. Foyt. Rather ironic that Foyt would win in 1977 and it would be Tony Hulman’s last '500'. The 1978 and 1979 programs are an artists depiction of the previous years winner. 1980 is the Pontiac Trans-Am pace car leading the field down the front stretch. A 1980 program with 1979 winner Rick Mears on the cover is known but it was more than likely a prototype as only one has been seen. The 1979 insert is a four page fold out and the 1980 insert is the first year to use color pictures of the cars and is also a fold out type of insert. The same three or four page fold out type of format with color pictures of the cars or one similar to it is still used today. 1981 is the first year to use an actual photo on the cover and it is the top of the Borg-Warner winners trophy. It is also the first year that a poster of the cover was issued by the Speedway. Cover posters are still issued today with the only exception being 2001 where Ray Harroun, a rookie winner, is depicted and 2017 where one was not issued. In 1984, the programs no longer have the pages stapled in but are glued into a square spine. This format remains so through today. The gold wing and wheel at the center of some 1992 programs were printed with out the gold on the wing and wheel. Some 1993 programs are missing the blue Indy car with wing & wheel at the top center of the program. It is uncertain how many of either year were produced before the errors were corrected but both error programs are very tough to find. The 1996 program folds out with the main feature being the Marmon Wasp surrounded by memorabilia from past years. The artist is James Dietz. The 1997 program features a modern Indy car and the Marmon Wasp behind it at the bottom with a field of various cars from the Speedways past coming down the front stretch in the background. Philip Castel was the cover artist. 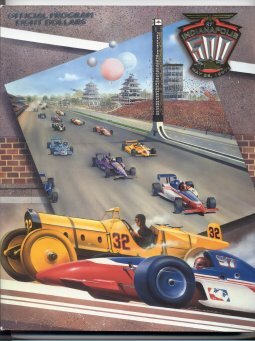 Dennis Simon was the cover artist for the 1998 program which features a modern Indy car in front of the Borg-Warner trophy. 1999 has a modern Indy car field in front of a scene from 1914 done by artist Bart Forbes. For 1998 and 1999 the Indy Racing League series sponsor Pep Boys appears on the cover marking the first time a series sponsor appears on a program since 1971. This is the last time a sponsor will appear on the cover until PennGrade Motor Oil does so in 2016. Dave Grove was the artist for the 2000 cover which depicts cars speeding past the new Pagoda. For 2001, the Speedway uses a holographic type panel glued to the cover. Located at top left of the 2002 program is a relief of the event logo which is used for the first time. After the tragic events of September 11th, 2001, the Speedway issued one of the nicest covers in some time. Photographer George Tiedemann has an American flag reflected in the Borg-Warner Trophy with a sepia toned checkered flag behind. Noted 60's psychedelic artist Peter Max painted the cover art for the 2003 program. Much of the 2004 program is in relief such as the Pagoda, the cars, the scoring pylon etc. and is representative of the 3-D design by artist Charles Fazzino. LeRoy Neiman designed the 2005 cover and it depicts Jimmy Bryan taking the checkered flag in 1958. The 2006 90th Anniversary program cover folds out and features various scenes from the month of May and some of the history from the Speedway over the past 90 races. The program cover changes from the familiar glossy to one which has a canvas look and feel and an insert coupon is no longer needed to get the race day line up insert. Artist Nicholas Watts depicts the dramatic win of Sam Hornish Jr. over Marco Andretti in the 2006 race on the 2007 program cover. After one year with a canvas look and feel type cover, the glossy cover returns for 2007. For 2008, the airtist David Uhl painted "Glorious Failure" which depicts the finish of the 1912 race with Joe Dawson taking the checkered flag as Ralph DePalma and riding mechanic Rupert Jeffkins push their car to the finish line after it broke down just 2 laps from victory. The 2009 program was designed and painted by Thomas Kinkade. The cover features famous past winners of the '500' in pit lane and the start of a modern era race on track with the IMS Centennial Era logo embossed at upper left. The program also has a packet inside with reproduction Centennial Era items inside including a 1934 credential and 1961 ticket. The program is the thickest one to date with over 225 pages and a cost of $12. For 2010, the price drops back down to $10 and has a non-fold out cover. Indianapolis artist Walter Knabe painted the cover art which depicts a modern Indy car against the front row from 1911. Below the modern car is the old style Wing & Wheel logo used in the pre-WWI era and at top left is the 2010 Centennial Era logo. Programs from 1976 through 2010 are much easier to find with some from the 2000's and older still available at the Speedway. If one had to choose which ones are the toughest to find in excellent condition, the error programs of 1992 and 1993 would be at the top followed by 1982 with the race day line up insert and 1977 through 1980 due to the use of a lighter stock of paper for the covers and pages. It is relatively easy to find a 1982 program as many were sold during the month of May, but the Speedway ran out of inserts on race day making programs with the insert tougher to find. The inserts from the rain shortened races of 1975 and 1976 may be harder to find without rain damage. The same may hold true for other years where rain was an issue on race day. Due to the nearly all black cover of the 1981 program, it is harder to find those with out some sort of wear to them, especially scratches. Over time, the holographic type panel to the cover of the 2001 program may be a problem with them becoming loose or detached - some were seen that month of May with the panel already missing.